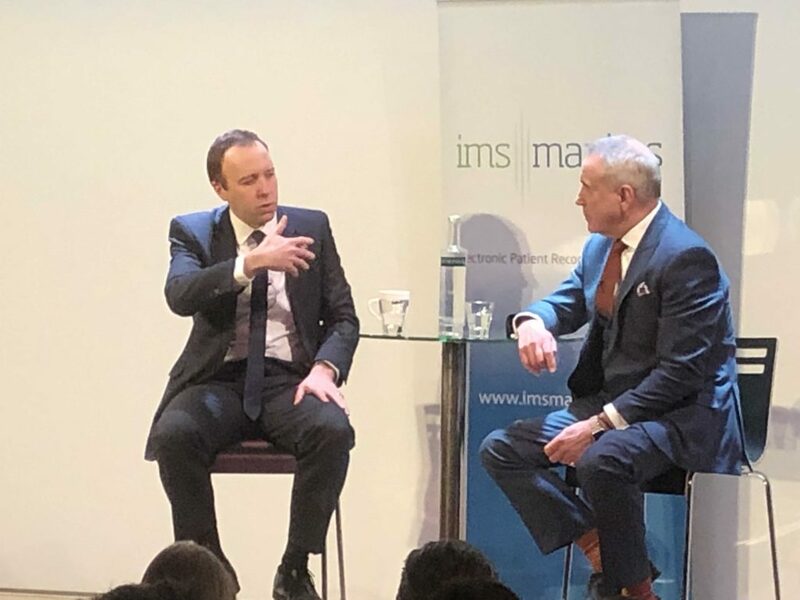 Matt Hancock could have been forgiven for feeling some little trepidation about his interview with Roy Lilley this week. While taking some comfort that he wasn’t facing a live bruising from Paxman or Andrew Neil, the Healthchat audience would be made up of highly informed health professionals; people who were less interested in the politics than the policies – the practicalities if you like – of keeping the NHS lights on. Keeping the lights on now being Mr Hancock’s responsibility, he might have envisaged being faced with the audience asking him some awkward, NHS-y questions. Added to which, as well as his own considerable specialist knowledge, Lilley’s interviewing style is disarming. He draws out the soft, human backstories (early life in Cheshire, first jobs, motivations and so on) and then, just as the shoulders relax, he lobs in an innocuous question on a gnarly subject. Like, say, the “whacky think tank” allegedly funding Hancock’s constituency office. And so it transpired. Hancock, so often portrayed as Tiggerish and not entirely in charge of his brief, actually comes across as a decent, likeable bloke. He’s self-deprecating in a very middle class, British sort of way. He’s a good yarn spinner, too, telling us about his encounters with his Newmarket constituency racehorses, and being trained to ride them by Frankie Dettori. On NHS matters, you can’t fault his enthusiasm. He told us – as all politicians will – that he has an overriding sense of duty of care to the NHS, “it’s been there for me and my family”. He wants to nurture it, not to let it trundle along but make it the best it can be. But what about the workforce Matt? It’s a mess and what are you going to do about it? The answer being that he’s not going to throw everything up in the air and start again – but instead, will be trying to persuade reluctant universities to provide more clinical training places. “It’s a very significant increase in many ways…a real, extra six billion cash and we’ve got a five year agreement.” He doesn’t like the short payback periods currently imposed across the NHS, so hopes the longer-term business plan arrangements will help. At last, it was time to let Mr Hancock wax lyrical about his favourite bit of the trainset he’s inherited. “YES IT IS!” exclaimed Mr Hancock, barely able to contain himself. His oft repeated mantra is that the cure to all the NHS’s IT ills is interoperability. And, underlining his vision/plan thing, he gave a thinly veiled warning to the four GP system providers that their long-held, data-hoarding practices would no longer be tolerated. “Pigeons work – it doesn’t mean it’s the best answer!” riposted Mr Hancock, coming over all Tony Hancock. Acknowledging the slightly cockamamie patient registration arrangements, he was unapologetic about his support for Babylon’s GP at Hand – but clearly champions high quality access to “classic” GPs via appropriate technology. Note; other online consultation providers are available – and, he assured us, the GP contract allows for both systems. So, when’s the social care Green Paper going to materialise? “Before April.” You read it here first. The audience came away perhaps a little more enlightened and most certainly entertained. In fact, there was a notable absence of post-interview harrumphing which was such a regular feature following any public appearance of one, J Hunt. And how was it for Mr Hancock? He may well have felt that his day started better than it finished. If you want to know why, read this.